Wheels are aligned with specific settings for toe-in and toe-out, positive and negative camber, and positive and negative castor. Each vehicle model can have different settings. Poor alignment affects your handling and causes your tires to wear very quickly. At DOWNEY Car Care Center in we install quality NAPA replacement parts. Give us a call at and let us help keep you safely and economically on the road. It's no surprise that your vehicle will drive better in the area if all the wheels are pointed in the same direction. That's called wheel alignment. If your wheels are out of alignment you may notice that your vehicle pulls to one side or the other. Something that you won't notice right away, but you will if you keep driving around when you're out of alignment, is that your tires are wearing unevenly and fairly quickly.. That's because when the vehicle is pulling to one side, you have to steer it back straight. The outside of the tire just wears out fast because you're constantly turning, which can be very exhausting on a long road trip from the area -fighting to keep the vehicle going straight down the road. Some of the things that commonly throw a wheel out of alignment are slamming into a pothole in , smacking a curb in or something like a rock in . And it doesn't have to be a big shock, it can just be the regular bumps and bangs of daily driving that add up and eventually take your vehicle out of alignment. That's why your owner's manual or service advisor at DOWNEY Car Care Center may suggest having your alignment checked periodically. With an alignment service at DOWNEY Car Care Center, we measure each wheel's alignment and to see where they are relative to factory specifications. While we have the vehicle on the alignment rack, we inspect the tires for wear as well as the suspension and steering components for damage or wear -things that can contribute to alignment problems. With some vehicles you can adjust all four wheels so we bring all wheels into alignment. On those vehicles where you can only adjust the front wheels, we bring the front into alignment relative to the rear. If it's been a while since you've had your wheels aligned, bring your vehicle to DOWNEY Car Care Center in for an alignment check. If your serpentine belt breaks, your power assisted steering may not work. Don't panic -your vehicle will still steer. It will just be harder to turn the wheel. Allow for extra time to turn and pull over as soon as it is safe. At DOWNEY Car Care Center in we install quality NAPA replacement parts. Give us a call at and let us help keep you safely and economically on the road. For most of us, it is hard to remember life without power steering – cranking those great big steering wheels? It was a pretty good workout. Now power steering is standard. The heart of any power steering system is its pump. The pump pressurizes the power steering fluid that provides assist for steering. Most pumps are driven by a belt that is run by the engine – a few are electrically powered. A high-pressure hose passes fluid from the pump to the steering gear. A low pressure hose returns the fluid back to the pump. These hoses can develop leaks, so it is a good idea to inspect them at every oil change. Low fluid can damage the power steering pump. That is why fluid level is on the checklist for a full-service oil change. The fluid needs to be compatible with the hoses and seals, so check your owners’ manual for the right type – or just ask your service technician. The fluid cleans, cools and lubricates the power steering system. It breaks down as the years go by and collects unwanted moisture, so it needs to be replaced from time to time. Many manufacturers specify power steering service intervals. Unfortunately, this important service is sometimes left off the maintenance schedule. So, when in doubt, every 25,000 miles/40,000 km or two years is a good fallback. Your service center will use a detergent to clean the system, flush out the old fluid and replace it with the good stuff. Here are some warning signs of trouble with your power steering: It’s harder to turn the wheel, there’s erratic power assist, you hear loud whining coming from the pump (which may be difficult to hear over the loud whining coming from the backseat), you have to top-off the fluid frequently, or you hear squealing belts. Remember to never hold the steering wheel to the far right or left for more than a few seconds at a time. That will wear out your pump real fast. Other steering components can be bent or damaged from wear or hard knocks. Ball-joint, idler-arm, steering-gear, steering-knuckle and tie rod to name a few. Warning signs here are steering play, wandering, uneven tire wear, and off-center steering wheel. An annual alignment check will reveal bent or damaged steering components. Most SUV’s, pick-ups and rear-wheel-drive cars need regular front-wheel-bearing service. The bearings should be cleaned and inspected. If they are excessively worn, they need to be replaced. The bearings are then repacked in clean grease. It’s also recommend the wheel-seal be replaced when the bearings are serviced. Like everything else, check your owners’ manual maintenance schedule. It’s usually required around every two years or 40,000 miles/64,000 km. If you drive through water, the bearings will need service more often. The main job of your shocks and struts is to keep your tires firmly on the ground. When shocks are worn, your vehicle won't handle as well and could even become unsafe. Replacing worn shocks and struts will extend the life of your tires and prevent other suspension damage. At DOWNEY Car Care Center in we install quality NAPA replacement parts. Give us a call at let us help keep you safely and economically on the road. Shock absorbers and struts last a long time and wear out pretty slowly for most vehicles in the area. They're easy to take for granted, but your shocks and struts do a very important job so you need to pay attention to them. They keep your tires on the road; and your tires are what connect your vehicle to the road and allow you to safely handle your car through turns, over bumps and even stop in time. When your shocks and struts are worn, your tires bounce excessively over bumps in our roads. Your vehicle will wallow through corners; your front-end will dive when you stop; and your rear-end will squat when you accelerate. All this hurts your ability to control your vehicle. And your ride just isn't as comfortable. Replacing worn shocks and struts saves money in the long run for our local drivers -and of course you can't really put a price on your safety and that of your passengers. We generally recommend replacing shocks and struts at 50,000 miles. When it's time for new shocks or struts, we've got you covered in . We can give you back the ride and handling of a new vehicle. And if you have special needs we can help you there too. We have premium shocks and struts that'll improve your performance. We can even help you with upgraded, heavy-duty shocks that'll give you the confidence you need to handle those big towing or hauling jobs. It's easy to take your suspension system for granted, but normal wear and tear can affect your handling and safety. A worn suspension part starts a chain reaction that stresses other parts and causes them -and your tires -to wear prematurely. Let us help you take care of your suspension. At DOWNEY Car Care Center in we install quality NAPA replacement parts. Give us a call at and let us help keep you safely and economically on the road. Let's talk about your suspension -you know, the system that connects your wheels to your vehicle, controls your handling and delivers a good ride as you cruise around . Your suspension is critical for proper steering, stopping and stability. Hey, it's a rough world out there in -every time you hit a pothole, a bump or an object in the road, your suspension system has to absorb the impact and maintain control. When a joint or other part is worn the suspension parts don't fit together as tightly as they should. Handling and steering has a loose feel and you may hear strange noises. Your tires will wear unevenly because they're bouncing down the road a little off kilter. When your service advisor at DOWNEY Car Care Center inspects your vehicle, he'll look for signs of suspension problems: things like uneven tire wear, excessive play in suspension components and other visible damage. He can replace the worn or damaged parts and restore safe handling. It's a great idea to take care of these problems right away before they become more expensive to repair. And nobody in likes to see a tire that should last for several years get worn out in a matter of months because of a bad suspension part. At DOWNEY Car Care Center in , we install quality NAPA replacement parts. You can reach us locally at . If you drive in axle-deep water, like crossing streams, launching a boat or fording deep rain puddles, your wheel bearings are at risk for water contamination. You may need to inspect your wheel bearings more frequently. And don't forget your trailers; especially boat trailers. It's a good idea to get them serviced at the end of the season so bearings don't rust over the winter. At DOWNEY Car Care Center in we install quality NAPA replacement parts. Give us a call at and let us help keep you safely and economically on the road. You might hear a groaning sound from your wheels. The sound might disappear at some speeds and reappear at others. Your service technician at DOWNEY Car Care Center can quickly tell if your bearings are bad by raising the vehicle and wiggling the wheel. When you grasp the top and bottom of the tire, it shouldn't move along the vertical axis. Many vehicles these days have wheel bearing assemblies that cannot be serviced at DOWNEY Car Care Center. When the bearings go bad, we simply replace the entire wheel bearing assembly. For those vehicles with wheel bearings that can be accessed, we can do some preventive maintenance. You may have heard the phrase 'pack the bearings'. With this procedure we remove the bearings, carefully clean them and inspect for any imperfection or wear. If the bearings can be reused, we reinstall them and pack them with grease. If not, we put in new bearings. Check your owner's manual or ask your service advisor at DOWNEY Car Care Center if your bearings can be serviced, and if so, when should it be done. Now, taking care of bad bearings is extremely important. 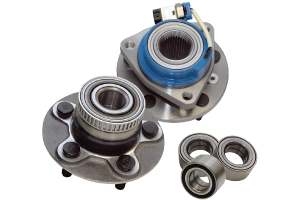 When bearings go bad, they generate tremendous amounts of heat -enough to lock up the wheel. That's not a good thing at any speed. In some cases the wheel can even fall off. Either of these could cause a serious accident. So have your wheel bearings inspected if you suspect a problem and replace them right away if there is one. Wheel balance weights can fall off and cause vibrations. When this happens you need to get the wheel rebalanced. It's estimated that 70,000 tons of lead weights are lost each year worldwide. Many states are banning the use of lead wheel balance weights for environmental reasons. Alternate materials such as zinc are now being used. At DOWNEY Car Care Center in we install quality NAPA replacement parts. Give us a call at and let us help keep you safely and economically on the road. Let's start with tire rotation. In normal driving around , your front tires wear more on the shoulders because they handle much of the cornering forces in turns. Front-wheel drive vehicles have even more force on the front tires. For most vehicles in , tires are rotated front to back. Some manufacturers recommend a cross rotational pattern that includes the spare tire, and some high-performance vehicles have different size tires on the front and rear and may even have uni-directional tires that can only be on the left or the right side of the vehicle. Your service advisor at DOWNEY Car Care Center can help you sort that out and will perform the right tire rotation for your vehicle. Your tire manufacturer will have a recommendation for how often you should rotate your tires. It's usually somewhere around 5,000 to 8,000 miles. Your Tire Pressure Monitoring System warning light goes off when a tire is 25 percent under inflated. If your recommended pressure is 32 psi, 25 percent below means you are at 24 psi; which is severely under inflated. At that low pressure, your safety is at risk, your fuel economy is hurt, and your tire is wearing out too fast. Check your pressure at least once a month. At DOWNEY Car Care Center in we install quality NAPA replacement parts. Give us a call at and let us help keep you safely and economically on the road. Government regulations requiring TPMS systems aim to reduce accidents in and save lives: A very worthy goal. There are also positive environmental effects because under-inflated tires are fuel wasters -you lose 1 percent of your fuel economy for every 3 pounds of pressure below ideal. So proper tire inflation can save you a tank of gas a year. And your tires last longer so you won't have to replace them as often. Because the TPMS system is so important to your safety, you should make the necessary repairs when needed. And remember, TPMS is no substitute for regularly checking your tire pressure-at least once a month.